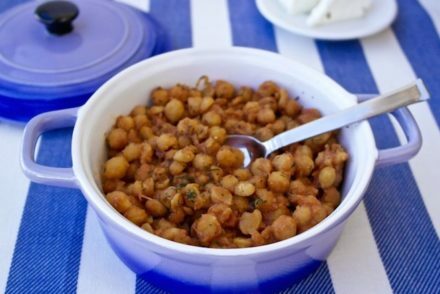 Greek cuisine has a way of making almost any vegetable desirable. Even if you thought you didn’t like it, somehow, when cooked the Greek way, it manages to be something you want to eat again and again. 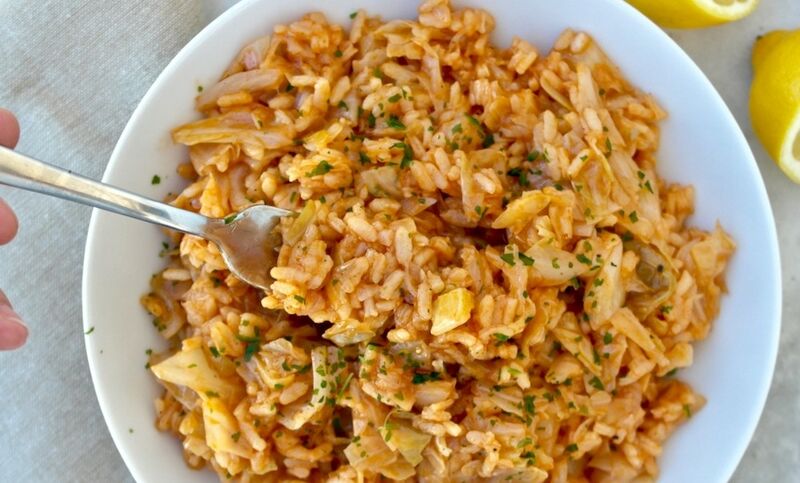 This can be said for this traditional cabbage and rice dish. We usually associated cabbage with coleslaw or that famous cabbage soup diet (remember that?) but here it is stewed to perfection along with rice and it is so good and comforting. Trust me, yes there may be cabbage, but you will love it! Lahanorizo belongs to a category of the popular one-pot Greek vegetable and rice dishes in which all the flavors meld together, the more popular one being spanakorizo (spinach and rice) and my favorite prasorizo (leeks and rice). Apart from the flavor, these dishes are quite (yes you guessed it) healthy. Once again you manage to get large amounts of vegetables in one serving. And these are vegetables rich in antioxidants, plus you are cooking this in olive oil adding even more goodness. Cabbage in particular belongs to the family of the cruciferous vegetables and is rich in vitamins and minerals, but also potent antioxidants and has been associated with reduced inflammation. This is served as a main course. If you are eating animal products you can also add feta which is a perfect accompaniment to this, and perhaps some bread, although you don’t really need it as it has the rice. And do not forget the lemon, it really brings out the flavors! And as with all the lathera dishes, this is good for 2-3 days. It actually tastes better the next day. I prefer it warm, but it can also be served at room temperature. This particular recipe is the basic version which I like the best, as there are not to many ingredients which may overwhelm the cabbage, but you can also add leeks, spring onion and carrots. You can also use more vegetables and less rice, just make sure to adjust the water. This works well with a bit of spice, I added some cayenne pepper, you can also try pepper flakes. Rice is very important in these dishes, as I’ve mentioned before. Many of you have asked me if you can use brown rice, you can but it will not get that creamy, melt in your mouth feel. Also no long grain rice either. Medium grain rice is what you need, here are some brands that offer medium grain that I found through a quick online search: Goya Medium Grain Rice, Carolina Medium Grain White Rice, Watermaid Medium Grain Rice. 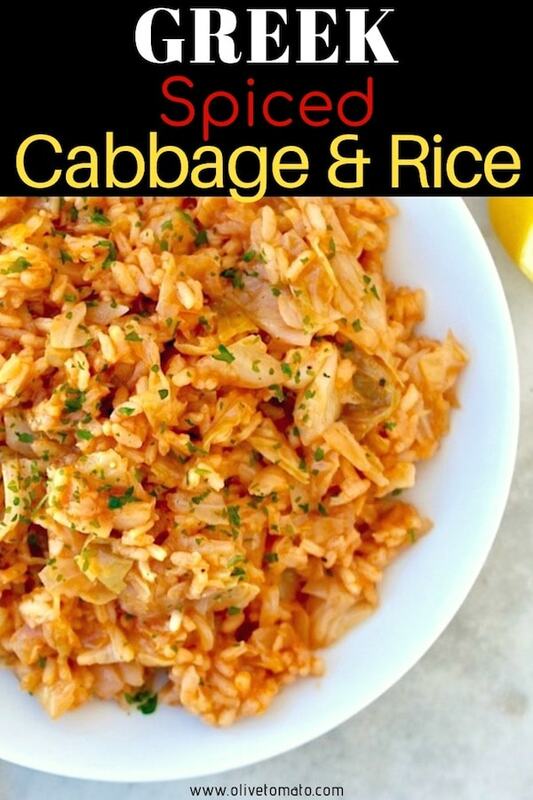 Creamy and Comforting Traditional Greek Rice and Cabbage. Add the cabbage and mix until cabbage is coated with the olive oil. Heat for 2-3 minutes (stirring) until cabbage has wilted somewhat. Add about 1 cup hot water hot water and simmer for 20-30 minutes until cabbage is soft. Add more water if needed. Once cabbage is soft add the tomato paste that has been dissolved in 2-3 tablespoons of water, and ½ teaspoon salt, freshly ground pepper and cayenne pepper and mix. Add ½ cup (uncooked) medium grain rice, stir so that rice is coated with the oil. Add 1 ¼ cup hot water and simmer until rice is almost cooked (about 15 minutes). Add more hot water in small amount if needed. Once rice is ready, but there is still a bit of water left in the pot, remove from heat and keep covered until rest of water is absorbed. Rice should be somewhat creamy. 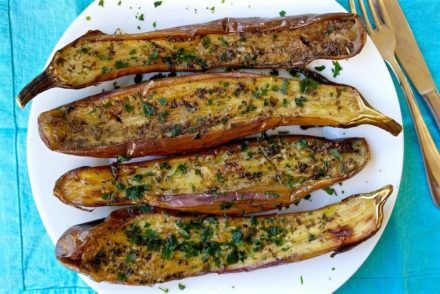 Serve with plenty of lemon and sprinkle with parsley. To reheat, you may add a bit more water to soften it. 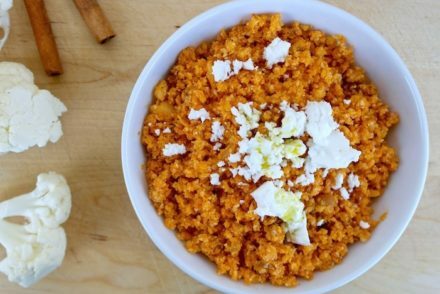 You may serve with some feta. Would it work if the rice is replaced with quinoa? I think it would. It may have a slightly different texture, but the cooking directions will be the same. What’s the measurement of water in this recipe, it just says 1 1/4 of hot water, 1 1/4 what? Hello, Thanks for catching that it is 1 1/4 cups of water. Corrected now. Hi Nanette, Japanese rice would be too sticky and not give the right texture. In my personal experience with this recipe, the fit of rice are all risotto type of rices. As Elena noted, “the rice should be somewhat creamy”. Thanks for your input! Yes arborio rice can also work as it is a medium grain rice. Do you wash the rice before you cook it? Or woud this prevent the dish from becoming creamy? Hi Maurus, No, I do not rinse the rice. Thanks for the reply. It turned out delicous. You are welcome Jane! Thank you! Just made this and it was DELICIOUS! My husband was skeptical, but ended up going back for seconds 🙂 it’s a perfect comfort food – thank you for sharing! This was absolutely delicious. Perfect winter comfort food. I actually used the whole cabbage. Just added a bit more rice, water and tomato paste. 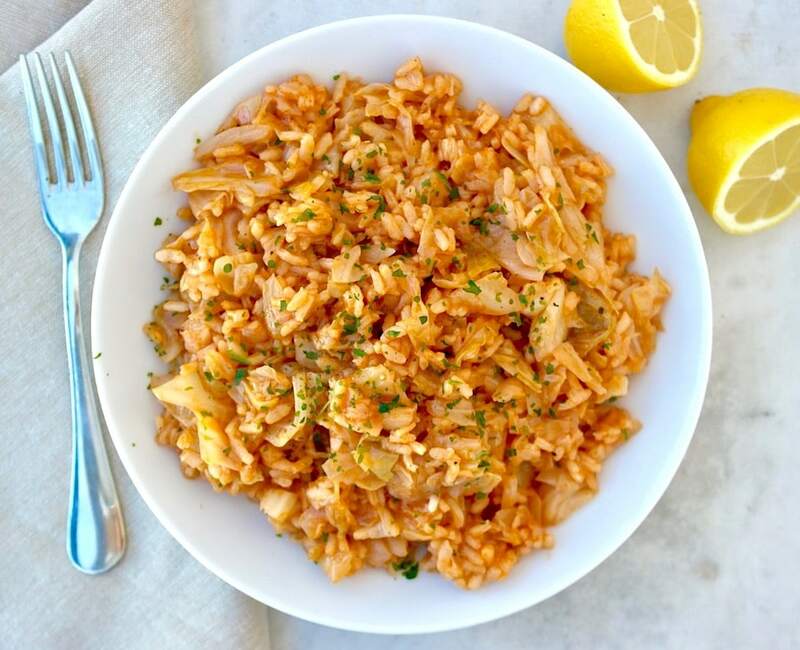 Greek cabbage with rice is a staple food in any Greek household, especially in the winter. Sometimes I use shallots instead of onion, depending on what looks good when I shop for ingredients. Love this recipe, my mom used to make it, & my sister does often.. I forgot how great it is, so thank you for reminding me. I always resort to the Spanakorizo. I also make a cauliflower rice and add fresh dill. Thanks for sharing Agapia! Love spankorizo too! I’m not crazy about spicy food, so I make this with dill instead of the pepper and the whole family loves it. It’s such a filling meal! Hi Elena – daft question I know but is it half of a “small, 300g” cabbage – or 300g for the recipe (half a 600g one)? I’d imagined the latter but I don’t cook with cabbage a lot, I just went to the supermarket and ours are about 400g total weight, so now I’m confused! As I have no benchmark I don’t know if our cabbages here in the UK are just particularly tiny 🙂 Also is there a particular type of cabbage you’d recommend more than others? Thanks so much for the recipe, I can’t wait to try this. The spinach rice is a staple here and now the leek one too – I honestly don’t remember what I used to eat before your site came along! Hi Aimee, Thank you for your kind words! For this recipe we use the classic green cabbage. If it is 400 grams you can use the whole thing. Thanks again for the recipe. Can’t wait for the next one! We ate this somewhere where they added raisins to it, and it went very nicely. BTW, your recipes are always my go to-as they are just perfect.